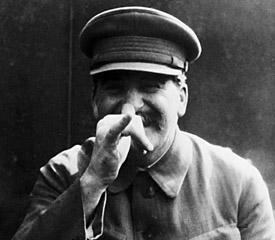 It is known, for example, that Stalin attended Tiflis Theological Seminary, along with the future of the famous magician, philosopher and occultist Georgi Gurdjieff, and at one time was quite friendly with him. There are also suggestions that Joseph Dzhugashvili was in some kind of occult "eastern brotherhood," which consisted of Gurdjieff and his followers. The sources, who tell about Gurdjieff mentions a mysterious figure - a prince Nizharadze. Under this pseudonym hiding man, whose essence replaced on an energetic level, giving it a certain program, that is, in fact, turning it into a zombie ... Gurdjieff describes an expedition to the Persian Gulf , among whose members were, he and Prince Nizharadze. He mentions that the "prince" on the way fell ill with fever, because of which the travelers had to stay for a month in Baghdad. It is known that in the years 1899-1900 he worked in Tiflis Dzhugashvili geophysical laboratory, so in theory he could take part in such an expedition. And the face was covered in pockmarks of the leader - it's not the consequence of it that "Persian" fever? In the era of Stalin's state security services to create an entire department dedicated to finding signs of extraterrestrial civilizations and ancient cultures. The Bolsheviks needed knowledge and technology that could make power invincible. They say also that in 1941 Stalin had secretly visited the famous Moscow blessed Matrona (Matrona Dmitrievna Nikonov). According to one version, Matron said to Stalin: "The Red Rooster win. Victory will be yours. You are one of the bosses will not leave Moscow. " On the other hand - the leader slammed his fist on the forehead with the words: "Moscow does not give up, think, think, and come as Alexander Nevsky, so all of them and lead." There is also evidence that the 'leader of the people "possessed magical knowledge and extraordinary abilities.No wonder the majority of portraits he is depicted with the same tube: the tobacco smoke was Stalin's magical defense, do not let the "other" into his aura. At least, so say experts, parapsychologists. Hohha needed a "father of nations" to get a burst of energy, as well as to predict future events: in this way, Stalin found out what trouble or danger might threaten him, and tried to prevent them. According to Andreev, during trance, Stalin also communicated with spirits and demons. Mass executions were no more than the sacrifices these astral beings. That's because Joseph Vissarionovich managed to stay in power for as long as no one failed Soviet ruler. Rasputin - a swindler or a miracle worker?